B U B B L E G A R M: Bourjois Bloggers Event London HQ! 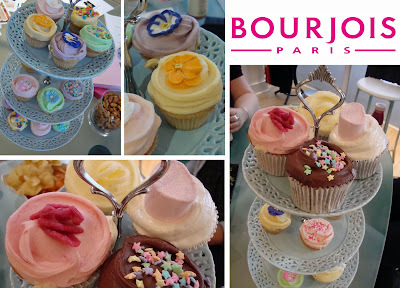 Bourjois Bloggers Event London HQ! I was lucky enough to attend the Bourjois headquarters in London for a bloggers event yesterday, and I have to say that it was so organised and LOTS of fun! There was only a select few people, which enabled us all to all interact and make it very personal. The HQ itself is so cute, and looks like a fun office to work in. All the girls that worked there are uber gorgeous,very friendly and so down to earth. What do I see as soon as I walk in to the room we were supposed to be in? Cupcakes, and lots of them! Bourjois have launched a fantastic Spring range that is mainly inspired by corals, peaches and golden hues. This is their ad poster that was created in Paris. The event started off with lots of eating and talking, we then watched a presentation of the Spring make up demonstrated by Bourjois make up artist Cassie Lomas. 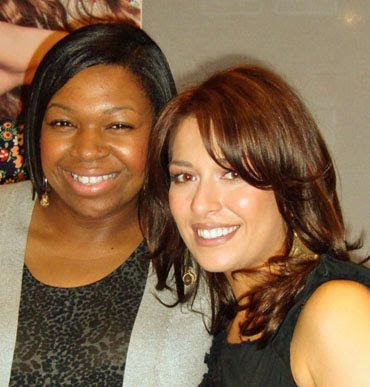 She was so lovely, she can do my makeup any day! Look how beautiful the models lips look, it's a sheer tangerine tone lipstick she is wearing but look at how pigmented it is. I want!! There was also a gold / green eyeliner pencil which looked amazing worn on the inner 1/3 of the lower lashline. 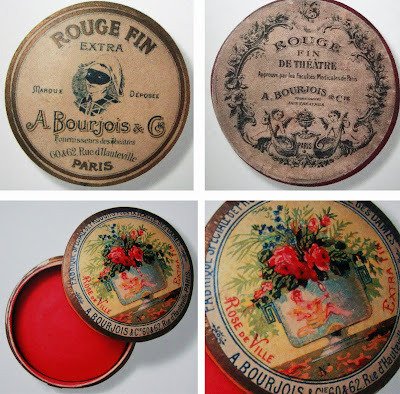 Bourjois is a brand with a lot of history, it was actually launched in Paris by Alexander Napoleon Bourjois in the 18th Century. This was a time when respectable women hardly wore makeup, However, Alexander changed that after his inspiration of the theatre and love for the stars of the stage. He created a light quality stage make up that became the "Official supplier to the imperial Theatre". Below are a few variations of what their packaging was like in the 18th Century. I think it looks SO beautiful and that the new packaging of Bourjois should go back to its roots. Here's me giving you a pose! And here's Vex In The City and me giving you some cheesy grins! We also had some makeup bags, how cute! Well, I have plenty to be trying and testing. No1 on my test-list is the new 'Healthy Mix' foundation they have launched. Will I like it as much as their 10hr sleep effect? We shall see! I will probably end up doing a 'favourites' post. Mmm those cupcakes look lovely! Looks like you and Vex had a great time, both looking as beautiful as always! yum yum yum cupcakes, I'm starting to develop a sweet tooth oh dear. LOL @ the 'after' shot. One word: RAIDED! that looks like LOLA cupcakes......heaven! gutted i missed this - loving the healthy mix foundation so far ! It was such a lovely event - and we were some very lucky beauty bloggers getting to raid Bourjois like kids in candy shops! Your pictures are so much better than mine - by the time I got round to taking pictures I think we had all managed to munch our way through almost all the yummy cupcakes. Anyway, wonderful way to spend a Saturday - make-up, cupcakes and girly chatter! Looking forward to reading everyone's reviews on our loot! Lucky you! Looks like you had a great time! The cupcakes look gorgeous and i love the look they created, tangerine lipstick is always good in my book! Sounds like you all had a great time. Loving Bourjois more unique shade names for the 10hr sleep effect foundation. I'm a light apricot rather then been labelled the usual Ivory, Porcelein or even 'light' or 'pale'. Light Apricot sounds prettier somehow! Sounds fun and you look gorgeous hun! Aww looks like so much fun:)) You look absolutly stunning:) I LOVE,LOVE,LOVe your outfit:) The dress is so cute! and love the bracelets:) You look amazing mA!! arghhh those cupcakes look so good! Seeing those cupcakes puts me in the mood to bake. Love the vinatge packaging they should defo go back to it. I love those clear tables! I want one for my make-up area!! Looks like an extraordinary event! I love Bourjois! and i'm loving the orangey coral colour of the lips and am intrigued by the foundation..! Thank you for the photos, Muhsine! @Beautyjunkielondon yes, as soon as I took the pictures, I started eating them! Love all your photos, what an awesome event!! Can't wait to see all the reviews! i am late to this post. this is beautiful! the cupcakes and the makeup! i have recently declaired healthy mix foundation a HG. i am in between 52 and 53 but i am sure i'd go down to 52 soon now that winter's approaching as i got mine in summer. that's one of the best bourjois products ever IMO. thanks for the great post. i wish i got to read it much earlier. Hi, and thanks for your blog! 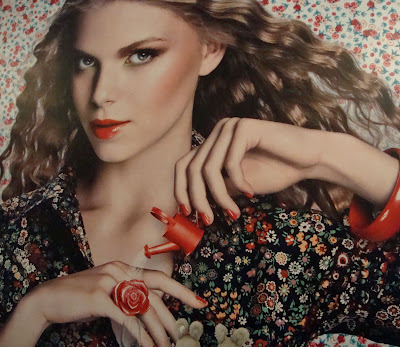 Could you tell me what is the name or number of Bourjois lipstick the model is wearing? Some of them I have been able to take part in through my school, but the rest I have found out about through one of the English speaking newspapers here: the Florentine or Florence News & Events.